Above: This Spanish Infantry flag's design, which first appeared in 1525 and featured the red Cross of Borgoña on a plain white field, saw use into the 18th century and formed the basis of many other Spanish banners. From ca. 1700 until the universally mandated appearance of marked military buttons for the Spanish military establishment in the 1790s, Spain's regular, provincial, and militia forces wore unmarked buttons, the great majority of which were of solid, often crude and robust, cast brass construction. Some of these typologies remained in use by local, "urban" militia until the end of the Spanish colonial period in 1821. These forms cannot, therefore, be neatly defined temporally as being "First Dominion," "Louisiana Period," or "Second Dominion" typologies, several types having seen use during two or all three of these periods. Right: Reenactors portraying the St. Augustine Spanish garrison of 1740 wear uniforms that reflect the colors of the Bourbon livery introduced in Spain with the accession of King Felipe V in 1700: Blue coats, waistcoats, and breeches; red cuffs, trim, collars (when such came into use), cockades, and stockings (which could also be white); and brass or gilt buttons and buckles. The most characteristic attribute of most Spanish military buttons of this period was the drilled wedge shank or eye by which the buttons were secured to their uniforms. Cast via the lost wax method by artisans who varied greatly in terms of maintaining standards of quality control, each button had an integrally cast, rounded to rectangular slab or wedge of metal fixed in an upright position to the button's reverse face. An eye was formed by drilling or punching a hole in the upright shank either prior to or following the casting process. A thin loop of iron wire was then passed through the eye, and the combined shank and loop were inserted through an aperture cut in the uniform element to which the button was to be attached. The buttons were then "gang fastened" together by a length of tape or cord tied off at the top and bottom loop of the button chain, allowing all of the buttons to be removed quickly and easily when the uniform was to be cleaned or replaced. 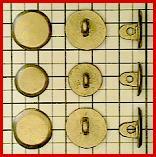 In this manner, one set of buttons might be used through several changes of clothing. With the exception of some cast pewter buttons (please refer to the Louisiana Infantry Regiment section of this website), officers' buttons, and the Panzacola type shown below, the drilled shank forms dominated Spanish military button design until, in the years immediately preceding the introduction of marked martial buttons, a family of Spanish military buttons combining cast metal bodies with robust copper or brass loops soldered or brazed to the buttons' backs appeared. Each of these buttons was hand made, and no two examples within any classification are exactly identical. Left: A St. Augustine living history reenactor in a ca. 1740 officer's uniform. During the early-to-mid-eighteenth century, some such officials are described as having worn buttons of embroidered gold or gilded metallic cord or thread. These buttons would have been either made with cut bone centers (see the "Military Artifacts from Spanish Shipwrecks" section of this website) or with supporting circular metallic loops like those shown at right. The loops formed circular frames around and over which could be sewn or embroidered the knotted pattern of the buttons; the completed buttons would then be sewn to the uniform. Embroidered buttons (with their accompanying loops) are still in use today. As a means of categorizing these forms, each button typology has been assigned a nomenclature in a manner closely akin to the archaeological classification of such other prehistoric and historic artifacts as projectile points, ceramic wares, and beads. Each name given to a button type is based on the commonly shared physical attributes, known distribution, and temporal placement of its cotypes (other examples of the same type). It is hoped that this method of organization will enable those interested in this subject area to more easily and efficiently communicate with one another when referring to any or all of the typologies illustrated and described here. Note: All illustrations feature 1/4" gridded backgrounds. Presently known only in the small sizes shown, the San Agustín group includes two subtypes: Round (left) and Octagonal (right). Both types have flat, usually thick body profiles with steeply beveled outer edges and integrally cast shanks with drilled eyes. Distribution is heavily focused in eastern Florida. Examples of the octagonal subtype have been recovered from the 1733 Plate Fleet. Originally lightly gilded, many of these appear to have been made as connected elements that were snapped apart and filed smooth along connection edges after casting. Found throughout the study region but more commonly encountered in eastern Florida than elsewhere, this type is flat in profile, occasionally exhibiting a very slightly convex face as a result of post-casting polishing procedures. Seen in large (coat), medium (waistcoat/vest), and small (gaiter) sizes, this type saw use through the American Revolution period. Classic examples of the form are shown at left; two variants are exhibited at right. Found throughout the study region but more commonly encountered in western Florida and Louisiana than elsewhere, this type is slightly convex in obverse and concave in reverse profiles and seen in coat (24-25mm), waistcoat/vest (20-21mm), and gaiter (16-17mm) sizes. Examples have also been recovered from Mexico, Panama, and Colombia. These appear to have seen use for approximately a century by regular Spanish troops and thereafter by members of local "urban" militia units. Classic examples are shown at left; a heavily constructed, large-shanked variant is exhibited at right. Similar in body formation to the Florida typology (to which it may be closely related) this is a unique form with a shank configuration consisting of thick, integrally cast, "X"-shaped crossing beams. There are two basic subtypes: Reverse Recessed/Rimmed (left and center), found in two sizes as shown, and Reverse Plain (right), known only in a large (25-26mm) size. This type was probably not a uniform fastener in the conventional sense; it may, rather, have served as a cockade button or in some other specialized mode of use. These are heavily concentrated in what once comprised Spanish West Florida, although it is probable that their distribution will ultimately prove to extend throughout a much wider geographic region. Focused in former Spanish West Florida, this is a heavy, thick, and quite crudely fashioned typology featuring a thick drilled shank with a characteristically rounded apex. The button's face is flat to very slightly convex with a recessed, slightly concave reverse. The size range of the form is represented by the examples illustrated. The small notch in the edge of the topmost example is the casting sprue removal point. Many cast brass Spanish buttons evidence sprue placement and removal locations on their outer edges. Worn by officers of the Spanish regular military establishment, bone or ivory-backed, foil-clad buttons like these were put into use by France, England, and the newly created United States during its War of Independence from Britain. Spain appears to have been among the first nations to put this type of button into use, and France retained such buttons, which were often very elaborately designed, through the Napoleonic period. Unlike its European contemporaries, Spain is not known to have ever marked these button forms. Spanish examples of this type are unusually thin in cross section compared to the ones used by other nations. They were attached to their uniforms via crossed catgut cords threaded through the drilled holes in the button's backs as shown on the unexcavated examples at left and right. The center, excavated specimens were clad with silver plated copper facing material and were worn by officers whose uniforms called for the use of "white metal" or silver trim and metallic accessories. Spain phased these buttons out of use soon after the American revolutionary period. Named for the site of Florida's Fort San Marcos de Apalache, near which the example illustrated was recovered, this is a solid cast tin drilled shanked button with a flat face, skirted edge, and taperingly recessed back. The riverine environment whence this came preserved this example; had it been recovered from the soils of this region it would probably have been reduced to an unrecognizable mass of oxidation. Little is presently known about this typology except for the fact that it would have been issued to troops whose uniform specifications would have called for the use of "white metal" buttons. While attributing this classification to use by any specific unit or branch of service remains very tentative, this relatively well-made and deeply convex typology conforms to regulations for and descriptions of Spanish enlisted artillerymen's buttons of the early to late eighteenth century. Examples have been recovered from various Spanish military occupation sites in both the former Spanish Floridas and Louisiana. The terminal date of 1797 coincides with the year in which definitive regulations for marked buttons for Spain's regular artillery forces were issued. Encountered in former Spanish Luisiana, both old West and East Florida, and Spain, this flat and sturdily constructed typology was exceptionally well made, lightly gilt washed, and representative of a terminal form of unmarked Spanish drilled shank military button. Coat sized examples (top) of this group have tapering, truly wedge-shaped shanks which, like the more delicate shanks of the type's smaller members (bottom), are set on small, roughened, circular fields in the centers of the buttons' backs. Resembling an ancient shield and named to reflect this coincidental similarity in appearance (a Rodela is a round shield or buckler), this rimmed, deeply convex typology is distinguished by its pronounced rounded to conical facial protrusion. This well-made type is believed to be a Spanish officer's button form of the early-to-mid-1700s. The shank on the variety at top, shown in a cross-sectional cutaway view, was formed by bending a sturdy rectangular and integrally cast upright and straight brass element into a loop after the button was cast, resulting in an eye connected at only one point to the button's back. Another, less common variety, shown below the loop-shanked subtype, features a more conventional solid, perforated or drilled shank. Both subtypes' known distribution is currently limited to the Atlantic coastal regions of southern Georgia and northeastern Florida. Believed to be another officer's form, there are two subtypes of this well-made, pan-shaped button classification: Drilled Shank (top) and Bent-Looped Shank (bottom). The Bent-Looped Shank typology, encountered in coat and waistcoat sizes, has a bent cast wire eye identical in construction to the Rodela type shown above. Probably directly descended from similar stud-shanked, pan-shaped forms of the late 17th century, examples with drilled shanks have been found in Georgia and eastern Florida, while loop-shanked examples are reported from the Carolinas to the Gulf Coast (including Mobile, which was not in Spanish hands until 1780). Based on currently available data, the Matanzas bent-looped shanked buttons appear to have seen use for a remarkably long period of time, from the latter part of the Spanish Mission Period until the American War for Independence. This presently unclassified button form, like other types sharing this shank configuration, appears to be directly descended from earlier stud-shanked Spanish military buttons. Its original bent-looped shank is broken near its base. The button's very well constructed body is convex, with a protruding outer rim. Its face features a raised central protrusion encircled by two raised rings. Variations of this convex "target" button design were popular among what are believed to have been officers in Spain's land and naval forces from the late seventeenth through mid-eighteenth centuries. This classification's members have cast brass bodies with thick, looped and cut brass or copper wire eyes unceremoniously brazed or soldered to the buttons' backs. Examples are flattened in profile and vary in thickness from thin to robust. This typology represents a very late unmarked button form that immediately preceded and overlapped the period of the introduction of inscribed Spanish military buttons in the 1790s. Shown here are ornately embellished examples of cast brass, drilled-shanked buttons of the ca. 1750-1790 period that may have been worn by Spanish officers, government officials, or civilians. Being unique specimens, they have not been assigned classification nomenclatures. The line details of the convex octagonal button at top were incised in the wax preform prior to casting; the button at the bottom, resembling the Panzacola type illustrated previously, was engraved following its removal from the casting matrix. Two presently unclassified eighteenth century Spanish military buttons are shown in the illustrations above. It is anticipated that these vest/cuff size button forms represent distinct typologies whose coat sized cotypes have not yet been recorded.